Last month we took a fun break to Jersey with Condor Ferries and what a wonderful time we had! We had visited Guernsey a few years back (also with Condor Ferries) but hadn't travelled to Jersey, the largest of the Channel Islands, so this was a lovely opportunity to visit and explore the beautiful island. On our visit to Guernsey, we had travelled as foot passengers on Condor and had used public transportation to get around Guernsey. This time around we wanted to take our car as well because that would make a big difference to how we got around the island and what we could see during our 4-day visit. Condor Liberation, the high-speed fast car ferry, that we travelled on has a passenger capacity of 880 and can also carry 245 cars. So booking our car in was very easy. At the time of booking, you need to provide information about the car - vehicle type, whether it has a roof load or rear rack lock etc. Condor Ferries also allow campervans, passenger vans and minibus. Because we were checking in with a car, we had to arrive at the port 60 minutes before departure time. Poole, our departure port, is around 3 hours from our place in Enfield and our ferry was scheduled to depart at 9:30 in the morning. So, we had to be there at 8:30 am and we were the first in the queue of passengers travelling to Jersey with a car! The check-in was fairly quick - we were given our boarding cards and a car sticker to be displayed on the windscreen. Shortly afterwards we were shown to the ferry. The ferry has its own version of a multi-storey car park and the staff directed cars into different areas based on their size and the destination. From the car deck, we climbed a single set of stairs to reach the passenger lounges. Ocean Traveller - which are standard airline style seats with folding lap trays. These seats offer easy access to Casquettes Bistro, The Island Bar and the duty-free shop. Ocean Plus - This is where we were seated during our journey and I must say the seats were very comfortable. The Ocean Plus seats are located in the spacious Horizon lounge which is at the front of the ship and has key card entry via a sliding glass door. The lounge offers lovely panoramic views. There are two types of seats within the Ocean Plus class - some are situated around tables while others are reclining with a tray table. Both types of seats have access to power supply. The journey to Jersey from Poole was around 5 hours and we found the Ocean Plus seats nice and comfortable. Ocean Club - If you want a little more luxury, then opt for the Ocean Club seats. Located in a private lounge, Ocean Club offers leather reclining seats and tables. In addition, you will also enjoy at-seat steward service. On-board there is the Casquettes restaurant which serves delicious hot meals and an Island Bar that serves Costa Coffee and other drinks. Horizon lounge has its own exclusive bar. The menu offered everything from traditional breakfast to a variety of main meals, snacks and a good selection of drinks. We had some sandwiches and the soup of the day and it was good. Condor Liberation has an on-board duty free outlet called Adore. There were great savings on a range of items - confectionery, fragrances, gift sets, gadgets, toys, wines, spirits and more. My pick was two 1 litre bottles of my favourite tipple for £22. A good saving over the supermarket prices that I pay back home. The highlight of our ferry crossing was the bridge visit. Condor had kindly arranged for us to visit the Captain and have a tour of the bridge. The captain was very friendly and happily answered all our questions. This was my first visit to the bridge of a ship and it was nice to see the crew working and monitoring the journey. Overall, we had a wonderful experience travelling with Condor Ferries. The boarding and disembarking processes were well organised, arrival times were maintained (we actually arrived around 5-10 minutes early), the sailing was smooth and comfortable and the crew (both on-board and the ground staff) were friendly. The duty-free shopping was a bonus! Everything was wonderful and we wouldn't hesitate to use Condor Ferries again. Although small in size, Jersey packs a punch when it comes to the number of attractions it has to offer. St Helier is the capital of Jersey and this is where the ferries from Condor arrive. St Helier is the hub of shopping in Jersey and can also be your base as you explore the island. In addition to the many unspoilt beaches (Plemont Bay was our favourite), Jersey also boasts of a number of other attractions - from historic sites like Mont Orgueil Castle and Battery Lothringen to museums like the Jersey War Tunnels and the Mansell Collection and from shopping venues like Liberty Wharf Shopping Centre and St Helier Central Market to high adrenaline activities like jet skiing and RIB voyages, there is plenty for visitors to see and do. Also on my favourite's list (from Jersey) is the Corbiere Lighthouse which is located in the south-western point of Jersey in St. Brelade. We went there on 2 different days simply because we loved the dramatic setting. Definitely a must-see for any visitor to Jersey. You can get around Jersey by bus or taxi but having a car at your disposal is advantageous. You can hire a car easily in Jersey but when you have the facility to bring your own car to Jersey, it makes sense to take advantage of that. It is a left-side drive in Jersey as in the UK but the maximum speed limit throughout the island is 40 mph. Ready to book your holiday to Jersey? 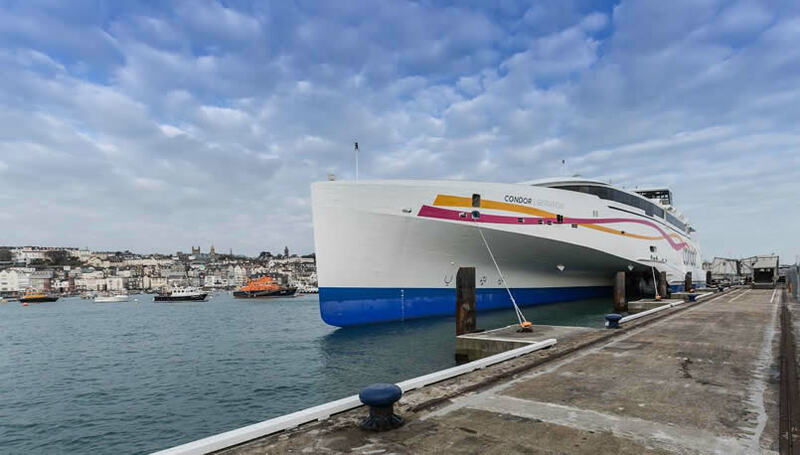 Condor Ferries operates a year-round service to the Channel Islands from Poole with its fast ferry Condor Liberation, alongside a conventional ferry service from Portsmouth. Prices start from £59pp each way with a car. To book, visit condorferries.com or call 0345 609 1024. We were guests of Condor Ferries. However, all opinions in this article, as always, are entirely our own.